Tower Lakes was first platted for development in 1924 by the real estate partners Myron H. Detrick and William E. Brooks, who purchased 70 acres of the Brooks/Paddock farm located at Davlin’s Corner (now the intersection of Indian Trail Road and Barrington Road). Detrick and Brooks, anxious to generate traffic for their failing Palatine, Lake Zurich, and Wauconda Railroad, developed this summer cottage resort by damming Mud Creek to form a lake and building a 68-foot steel observation tower on the west side of the lake, from which you could see the Fox River. They subdivided their purchased parcels into small lots and began promoting and building their tiny resort community. Thus, Tower Lake Park was born. In 1925, then-famous radio evangelist Paul Rader visited the hilly, open space of Tower Lake Park and decided that it would make a perfect site for religious revivalist meetings. That summer, he purchased Tower Lake Park and hundreds of surrounding farmland acres. Rader broadcast many weekend meetings from here, thereby putting Tower Lake Park on the national map. By 1926, Evanston-based Nazareth Barsumian, considered to be the father of present-day Tower Lakes, had also visited the area and liked what he saw, so he purchased the property from Rader. 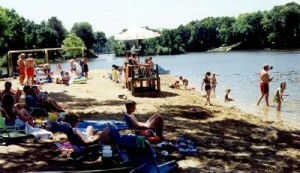 Barsumian immediately understood the potential of the bucolic lakeside area as a residential community. His design for Tower Lakes Estates incorporated a love of nature and and enthusiasm for outdoor life. Barsumian created a wonderland for swimming, fishing, and boating. In 1931, the Tower Lakes Improvement Association (TLIA) was chartered to act as the governing body of the growing community. In the 1940s, home construction focused on year-round residences rather than summer cottages, and wintertime usage of the lake and surrounding area grew. The Village of Tower Lakes was incorporated in 1966. Working with the TLIA, which owns and manages the lakes and parks, the Village of Tower Lakes works to preserve our natural resources while promoting an actively involved electorate. Through building and zoning ordinances, the village helps protect access to and views of the lakes and parks. In response to residents’ air-quality concerns, we have limited leaf burning to restricted dates and times each spring and fall, and we encourage residents to limit chemical lawn treatments to prevent runoff into the lakes. Along with TLIA, we assist in active participation by residents in twice yearly clean-up projects that include public spaces. We are proud to have earned federal designation as a “tree city” for 20 years, and we revived a program of reforestation whereby the village pays half the cost of young trees, encouraging residents to plant new trees. In addition to our obvious natural resources, Tower Lakes has two resources not typical of a municipality its size: our own water company and our own police department. The Tower Lakes Water Company was purchased from private owners in 1995. Ownership of our own system causes us to focus more acutely on area concerns such as aquifer and water recharge areas. The Tower Lakes Police Department employs 18 part-time police officers who offer vacation home watches, quick responses, and personal connections. Outside of our community, Tower Lakes police officers can be seen at North Barrington School each morning and afternoon controlling traffic, responding to calls throughout the area, and providing backup to other local forces. Tower Lakes is naturally beautiful, but mostly Tower Lakes living is about having fun. Neighbors enjoy participating in homeowner association– sponsored events, including winter events, springtime’s Progressive Dinner, our days-long Fourth of July celebration, and fall’s Chili Cook-Off. But people don’t wait to have their fun organized for them. It isn’t unusual to see a group of young adults throwing together a spur-of-the-moment hockey game in the middle of an ice-covered lake while parents teach their young ones by the shore. The summer months will find people of all ages at the beach, and anytime of year you’ll find people enjoying the gifts Mother Nature gave us. If you’re in the area, take a drive through Tower Lakes. I think you’ll see why we all love living here. The Village of Tower Lakes Village Board meeting scheduled for Monday, February 18, 2019 has been cancelled. The date of the next regularly scheduled meeting is Monday, March 18, 2019, 7:30 p.m. at the Tower Lakes Village Hall, 400 N. IL Route 59, Tower Lakes, IL. The Village of Tower Lakes Plan Commission meeting scheduled for Wednesday, February 13, 2019 has been cancelled. The date of the next regularly scheduled meeting is Wednesday, March 13, 2019, 7:00 p.m. at the Tower Lakes Village Hall, 400 N. IL Route 59, Tower Lakes, IL.